Rejoice, workaholics worldwide, because it turns out your steady diet of caffeine and alcohol might actually be doing you some good. No, you didn’t misread that: coffee and alcohol consumption may increase your lifespan, according to surprising new research. According to researchers at University of California, Irvine, moderate alcohol and coffee intake can reduce your chances of a premature death by up to 18 percent. To give you an idea of the age group we’re talking about here, all participants in the study were at least 90 years of age. 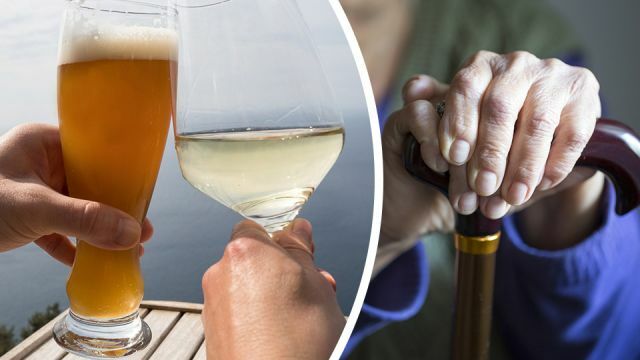 According to the study, participants who drank two glasses of either beer or wine had the best shot at outliving their peers, with an 18 percent chance of avoiding an early death. Meanwhile, those who drank two cups of coffee a day had a ten percent chance of doing the same. “I have no explanation for it, but I do firmly believe that modest drinking improves longevity,” said researcher Dr. Claudia Kawas to The Independent. However, there are a few caveats. For one, the longest surviving participants of the study also engaged in regular exercise and had hobbies to keep their brains healthy. Coffee and alcohol are far from the only things that can keep you out of the ground for a few extra years. Back in 2006, Japanese researchers found evidence to suggest green tea can reduce the risk of an early death by up to 26 percent. Telomeres are the ends of your chromosomes, and as you age they tend to fall apart. A diet rich in sources of omega-3s, such as salmon, can slow this process. That’s according to a study from the Ohio State University. If you love to snack on nuts, then we’ve got good news for you. A Harvard University study found evidence to suggest that nuts can not only make you live longer, but also reduce your risk of heart and respiratory diseases, along with cancer. This might sound like an odd one, but worth trying given the source. Until April 2017, Italian woman Emma Morano was the oldest confirmed living person. She died aged 117, and according to her the secret to longevity is eating three raw eggs a day. The story behind this unusual suggestion began when she was a teenager, and a doctor advised her to eat raw eggs for her anemia. In the last few years of her life, she went down to cracking just two raw eggs a day. What do you think? If you’ve got a secret food for staying alive longer, let us know in the comments below! Hey Buddy!, I found this information for you: "Study: These Drinks Help You Live Longer (Plus 4 Ways To Slow Aging)". Here is the website link: https://www.thealternativedaily.com/new-study-says-alcohol-and-coffee-may-help-you-live-longer. Thank you.